Holtspur Bottom Butterfly Reserve is on the south facing hillside at the end of the Holtspur Valley, opposite the Holtspur Bank Local Nature Reserve. 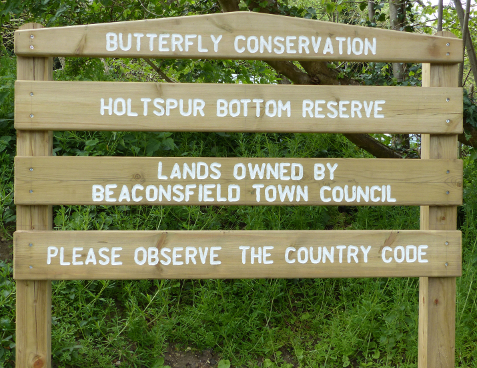 It covers around 4.5 hectares (about 11 acres), is owned by Beaconsfield Town Council, and has been managed by the Upper Thames Branch of Butterfly Conservation since 1998. It is one of the few reserves in Britain managed specially for butterflies and moths. It is mostly chalk grassland, with smaller areas of rough grassland and hedgerows. Each of these habitats is managed to make them attractive to different moths and butterflies. The whole reserve can be visited on foot, and there are notice boards around the site to help identify the species you see. You can download a leaflet for the reserve here. Holtspur Bottom and the nearby Holtspur Bank Local Nature Reserve (LNR) are supported by a Higher Level Stewardship Agreement with Natural England. The LNR is also owned by Beaconsfield Town Council and managed by their volunteers. If you would like to help us care for this reserve, why not see how you could help us?